Description: Create spiral components and vary their size and mix pearls and seed beads together to get the look of elegant spirals. Attach them to a double cord, and create a dynamic neck piece in several hours. Learn a modified version of peyote stitch to create these spiral treasures. 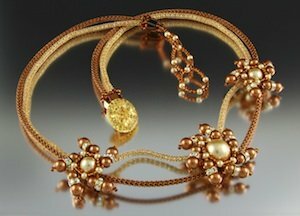 Learn how to combine crystals, pearls and seed beads in a different way.